If you’re interested in coming to stay and work with us, you might like to know what we do through the seasons. – Not so much, well, we do a lot but we don’t need help in winter. – At the end of March we tap about 20 Manitoba Maple trees and make maple syrup. 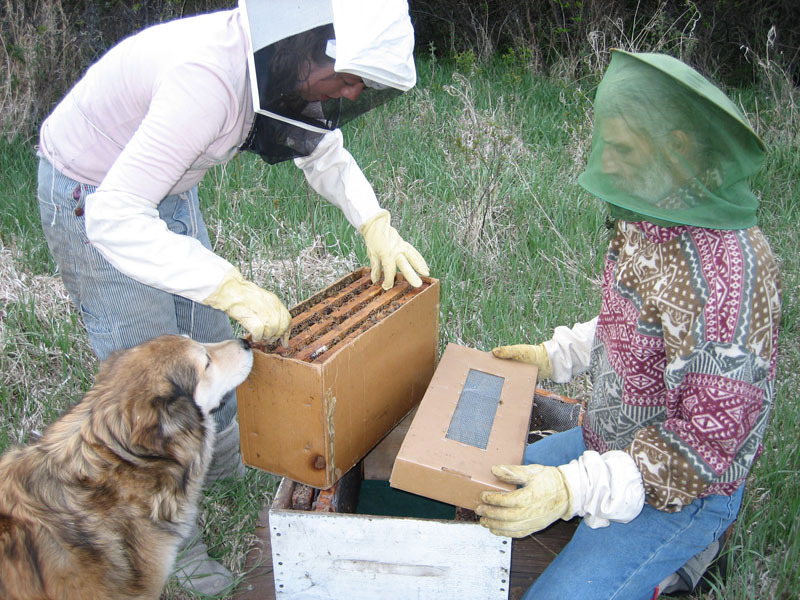 – In March or April we open up our bee hive and ensure all is healthy and well in there. – In April we begin preparing a large garden for planting. – April, May and the beginning of June are busy growing in the greenhouse and selling/transporting bedding plants. – Mid May to beginning of June we’re planting the garden. It gets a bit busy end of May. – We tend to the needs of our horses – clipping hooves and doing some training and riding if we can fit it in. We also need to check the fences and do some repairs. – We get guesthouse visitors (paying guests) over winter but in spring the pace picks up a bit. We also start getting learning-tour groups – not a lot but we need to keep the place looking good, and clean up after folks leave. We need to trim the walking trails as well. – We tend to the garden – weeding, watering some, and harvesting for the Farmers’ Market. – Prepping and selling veggies, baking, dried herbs, iced tea, etc. at the Farmers’ Market every Friday. – We tend to kick back a bit more – swim when it’s warm enough, attend various festivals and family gatherings and plan any major or minor construction projects we want to complete in summer/fall. – We harvest berries and put up jams and some frozen packages for winter. – There are always construction and repair projects to be attended to. 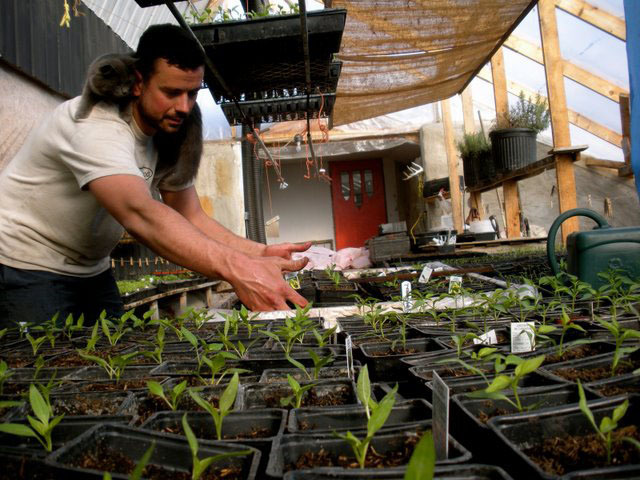 – Here the tasks become more wwoofer led in that we’re not as driven by the Greenhouse and Garden-planting agendas. Sometimes wwoofers choose to take on the garden as their project and others prefer to get involved in construction work and others love to simply float from job to project to job. I tend to offer lots of opportunities for creative, innovative involvement. We’ve been so blessed by experiments and expressions initiated by people who have arrived and settled in good spirit. – All summer we tend to the bees (a couple hours a week). In August we extract honey from the hives. – We host another Wilderness Course the second weekend of September. – Lots of harvesting, drying, preserving, freezing and good eating – the best time of the year! – Usually constructing and repairing something on the yard. – Planting Garlic and putting compost on the garden – preparing it for the winter. – Sieving sand, compost and flax shives to prepare soil mix ingredients for next spring’s greenhouse season. – Collecting and stacking firewood for the winter and cutting firewood for the following winter. We use chainsaws and an old farm truck. I’m sure there’s more, but you get the drift. If you want to know what the specific projects are for this year, feel free to ask. We prefer longer rather than shorter stays, but are flexible. Our diet is also flexible. We buy various meats from local farmers but are also comfortable with vegetarian and vegan – especially if you’re keen to help out in the kitchen. Actually, we prefer that wwoofers get involved in food preparation and domestic duties along with us as a family – but again, we’re flexible.